Andrew Pullin does not have any MLB stats for the season. Draft: 2012, Philadelphia Phillies, 5th rd. Andrew L. Pullin (pronounced PULL-in)… 2012 graduate of Centralia High School (WA)…Hobbies: Being outdoors and hiking…Signed by: Rick Jacques. Among all minor league players, was T-2nd in doubles (43) and T-5th in XBH (66)...Was the first Phillies minor league player with at least 40 doubles since 2012 (Jim Murphy, 43)...Began the season with Reading (AA)...Slugged a walk-off HR in the 13th inning, 5/31 vs Portland... Was promoted to Lehigh Valley (AAA) on 6/22...At the time of his promotion, was T-2nd in the Eastern League in doubles (22) & XBH (37) and T-5th in HR (14)...Played in 4 International League playoff games. May 31, 2018 LF Andrew Pullin retired. 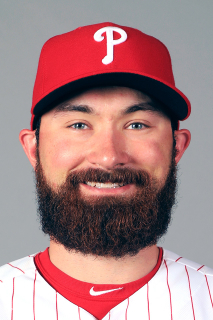 January 17, 2018 Philadelphia Phillies invited non-roster LF Andrew Pullin to spring training. June 22, 2017 LF Andrew Pullin assigned to Lehigh Valley IronPigs from Reading Fightin Phils. January 11, 2017 Philadelphia Phillies invited non-roster LF Andrew Pullin to spring training. September 26, 2016 Reading Fightin Phils activated LF Andrew Pullin from the 7-day disabled list. August 28, 2016 Reading Fightin Phils placed LF Andrew Pullin on the 7-day disabled list retroactive to August 27, 2016. Right elbow sprain. July 7, 2016 Reading Fightin Phils activated LF Andrew Pullin from the 7-day disabled list. June 26, 2016 Reading Fightin Phils placed OF Andrew Pullin on the 7-day disabled list. Strained left groin. June 23, 2016 OF Andrew Pullin assigned to Reading Fightin Phils from Clearwater Threshers. May 11, 2016 OF Andrew Pullin assigned to Clearwater Threshers. May 10, 2016 Philadelphia Phillies signed free agent OF Andrew Pullin to a minor league contract. April 9, 2016 OF Andrew Pullin retired. March 3, 2016 OF Andrew Pullin assigned to Philadelphia Phillies. April 4, 2015 OF Andrew Pullin assigned to Clearwater Threshers from Lakewood BlueClaws. March 30, 2014 2B Andrew Pullin assigned to Lakewood BlueClaws from Williamsport Crosscutters. June 15, 2013 2B Andrew Pullin assigned to Williamsport Crosscutters from GCL Phillies. June 21, 2012 Andrew Pullin assigned to GCL Phillies from Philadelphia Phillies. June 14, 2012 Philadelphia Phillies signed OF Andrew Pullin.